In 79 CE, a catastrophic eruption of Mount Vesuvius sent volcanic ash raining down on the city of Pompeii, trapping the residents underneath the ash. Centuries later, the bodies have decomposed, leaving voids in the ash that have long given an eerie glimpse of the last moments of the doomed. 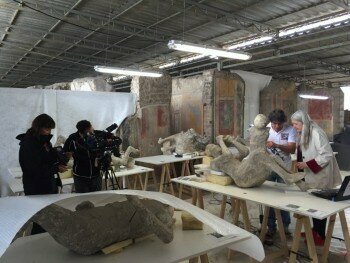 Previously, researchers used plaster to recreate the bodies of Pompeii from the voids. However, now the the World’s Advanced Saving Project (WASP) has been chosen to recreate the casts for future generations using 3D technology. “The casts are the most sought testimonials from abroad,” Massimo Osanna, overseer of the project, said. He added that using 3D technology is a perfect way of preserving the past and keeping cultural heritage alive. The precision available through 3D printing has also allowed the last moments of the men and women who died to be seen in more detail than ever before, from the clothing that they were wearing to the final look on their face. The results reveal more about the Pompeii residents last moment and provide an opportunity for more people worldwide to see the famous casts of the Pompeii dead.